When you’re up against tight deadlines it’s good to have some tricks up your sleeve to be able to get project tasks completed more quickly. 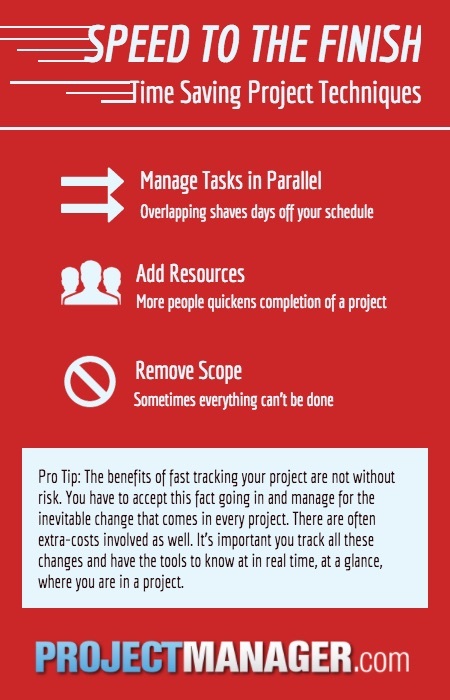 you get the benefit of your project more quickly. Let’s dive into the techniques you can use to save time on your projects. The first place to look on your project schedule is at tasks that happen in sequence. This is what project managers call ‘fast tracking’ and it means having several tasks on the go at the same time. Go through your plan and identify the activities that are currently scheduled to happen in sequence. Then think about which of these could be overlapped. At first glance it might not look like any tasks could be worked on in parallel but think creatively about how you could make it work. Where tasks have different resources you could perhaps start one before the other has ended. Where tasks are dependent on each other you can carry out a risk assessment to see how soon you could start the second task even taking into account that the dependent task hasn’t fully completed. Where the risk isn’t too high the opportunity to shave a few days off the schedule could easily be managed. Check your resource allocations after you’ve amended your schedule so you are sure that your changes haven’t overloaded one team or individual. Work generally goes faster when there are more hands working on it. If you can afford to add more people to the project, then this is a good way to speed things up. Any work that can be split up and given to more people is a good target for crashing. You don’t have to physically add more people either. Ask your existing team if they are prepared to work overtime. If you can increase your budget to pay for their extra hours then you could save time on the project with the people you already have. There may be other opportunities to save slivers of time here and there. For example, if a task can’t start because you are waiting on delivery of stock, you could pay extra to have it shipped overnight so your team can start straight away. Sometimes even saving a few days on your project schedule will make a big difference, so hunt out those possibilities and exploit them for the leanest possible plan! The final option is to accept that you can’t get everything done and look at what you can take out of your project scope. You’d normally use this as a last resort, a way of accepting that something delivered is better than nothing. If you choose this route, be sure to note down what you’ve taken out of scope (i.e. QA time, selected features) as you’ll have to deliver this in a later sprint or phrase and you don’t want to forget about it. Speeding up your project is not without dangers. You planned your project in a particular way because it meant you could fully control and monitor progress, and now you’re looking at doing something quite different. Barbara Knecht writing in Architectural Record also discusses potential impacts on the client relationship, specifically in the construction industry where fast-tracking is quickly becoming the norm. The main challenge of managing tasks in parallel (apart from the effort involved in having to redo your plan and reschedule resources) is that it adds much more risk to the project. For example, you could buy all the furniture for the new office you are building before it is completed, but you run the risk that the dimensions change slightly during the fit out and the big items you’ve purchased are no longer suitable. Or you could design the marketing materials for getting your new app in the app store based on current graphics only to find that once the app has been tested the developers make a few changes and your marketing is out of date before you’ve even used it. As in this example, there is a risk of rework when you start a task early, so you’ll have to accept and manage that. You have to pay for resources if you want to add them to your project to crash the schedule. Doing work more quickly costs, sometimes significantly. There is also the risk that you have to bring new team members on to the project, train them, show them what to do and manage their work. You should measure whether you will actually save any time by adding new team members: sometimes it’s better not to. If you do decide to add extra people, try to make sure they are experienced at what they do and can hit the ground running. You’ve probably heard the phrase, “It takes one woman nine months to make a baby, but nine women can’t make a baby in one month.” Be pragmatic about the time you can save when you add resources to the team. Finally, there’s the danger that you do a lot of work to fast track your project but you don’t see any difference to the end date. Focus on project tasks that fall on the critical path. This is the longest route through the project and defines the duration. Tasks that don’t appear when you highlight the critical path on your plan won’t help you reduce the end date. Focus on the right tasks so you get the most benefit from schedule compression. Working with your project schedule is easy when you use intuitive yet powerful online tools. A few clicks are all it takes to show your critical path, highlight tasks to amend and drag and drop them on the project schedule. You can create a new plan and try out lots of different variations with ProjectManager.com. Our online tools will help you build the perfect plan and deliver on time, every time. Try it for free today.